New research makes panspermia—the spreading of life from one planet to another—more likely. After being heated to 420°C (788°F), about 40% of certain bacterial spores survive. Turn Up the Heat: Bacterial Spores Can Take Temperatures in the Hundreds of Degrees by Dirk Schulze-Makuch, airspacemag.com, 27 Sep 2018. Thanks, Google Alerts. Comets: The Delivery System includes a section titled Dust and Spores which cites a similar finding made by Hoyle and Wickramasinghe in 1979. Bacteria: The Space Colonists has more about the hardiness of bacteria. Ancient Mars had right conditions for underground life..., Brown University (+ScienceDaily.com), 24 Sep 2018. Methane on Mars and Habitability: Challenges and Responses by Yuk L.Yung et al., Astrobiology, 19 Sep 2018. Life on Mars! has more. Thanks, Theodore Rigley. ...Japan's Two Hopping Rovers Successfully Land on Asteroid Ryugu by Meghan Bartels, Space.com, 22 Sep 2018. Comet Rendezvous is a related posting under "Can The Theory Be Tested?". De novo genes continue to confound standard darwinism. They are found everywhere with important functions, yet apparently, their programmatic content has no darwinian provenance. Deep taxon sampling reveals the evolutionary dynamics of novel gene families in Pristionchus nematodes by Neel Prabh, Waltraud Roeseler, Hanh Witte, et al., doi:10.1101/gr.234971.118, Genome Res., online 19 Sep 2018. Young genes have distinct gene structure, 3 epigenetic profiles, and transcriptional regulation by by Michael S Werner, Bogdan Sieriebriennikov, Neel Prabh, et al., doi:10.1101/gr.234872.118, Genome Res., online 19 Sep 2018. 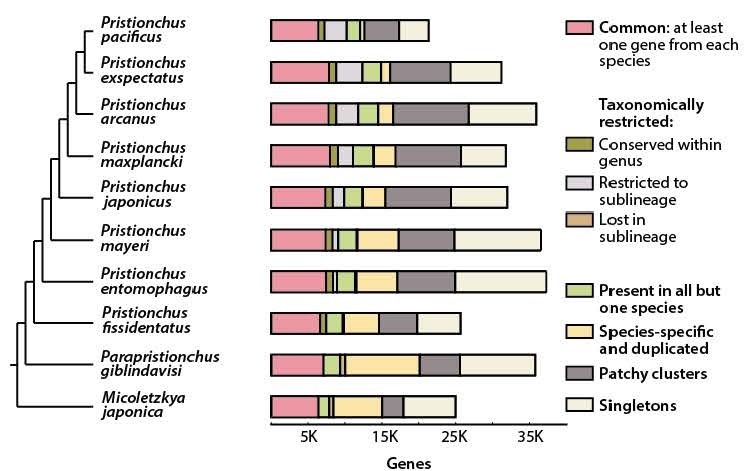 Species-specific, new, or 'orphan' genes account for 10-30% of eukaryotic genomes. ...An increasing number of orphan genes have been shown to provide important phenotypic innovation. How new genes acquire regulatory sequences for proper temporal and spatial expression is unknown. ...Are these transcribed new genes 'born' into open chromatin and serve as a template for evolution, or have they already acquired nascent function and their presence in open chromatin is a result of translocation to increase their expression? Additional functional genomic comparisons and synteny analysis may shed light on these questions. Uprooting the Tree of Life by W. Ford Doolittle, Scientific Amer., Feb 2000. Many eukaryotic genes ...seem to have come from nowhere. In cosmic ancestry genes must come first. De novo genes are a basic prediction of the theory. New genetic programs in Darwinism and strong panspermia includes our argument for genes "from nowhere". Three New Human Genes has become our main webpage for updates about de novo genes. Study Explores Possibility of Life on Moons of Rogue Planets, UNLV via Newswise, 15 Sep 2018. Survivability of Moon Systems Around Ejected Gas Giants by Ian Rabago and Jason H. Steffen, MNRAS, 18 Sep 2018. The Tangled Tree, by science writer David Quammen, is excellent. He has researched the discovery and exploration of horizontal gene transfer (HGT) very deeply, and his writing kept us engaged. We especially enjoyed closeup looks at dozens of scientists whose work we know, including W. Ford Doolittle, George Fox, and the principal character, Carl Woese. Quammen's colorful anecdotes and pithy descriptions only made it better. For those wanting more still, there are some 75 pages of endnotes, bibliography and indexing. Finally, we are quite pleased that HGT gets the recognition it should. Quammen mentions lots of supporting evidence, as we do here. But we first came to HGT from the opposite direction — skepticism. We wanted to know where new genetic programs come from. The standard Darwinian answer seemed unsupported and implausible. We concluded that new genetic programs must be somehow supplied in an open system. That paradigm shift, we now realize, is way too big to swallow whole. For now, we welcome the major advance that Quammen makes clear – the importance of HGT in evolution – and the future it may portend. 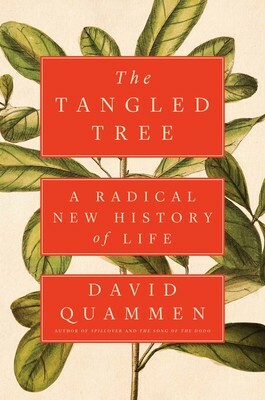 The Tangled Tree: A Radical New History of Life by David Quammen, Simon & Schuster, ISBN 9781476776620, August 2018; reviewed by John Archibald, Nature, 31 Jul 2018. Quammen interviewed on NPR by Scott Simon [transcript], Weekend Edition Saturday, 11 Aug 2018. Quammen interviewed on PRI by Adam Wernick [with audio], Weekend Edition Saturday, 22 Oct 2018. Viruses and Other Gene Transfer Mechanisms has background with recent & older links related to HGT. The Tree of Life has a short history and updates for this subject. Doolittle spoke bluntly alongside Fox and others on a panel at the Library of Congress, 17 Mar 2016. Life on Mars? 40 Years Later, Viking Lander Scientist Still Says 'Yes' by Leonard David, Space.com, 31 Aug 2018. Life on Mars! has more about Gil Levin and the Viking LR experiments. Thanks, Martin Langford. Many habitable zone (HZ) exoplanets are expected to form with water mass fractions higher than that of the Earth, and the prospects for life there are good, according to two American geophysicists. Thanks, Bill Smith. Habitability of Exoplanet Waterworlds by Edwin S. Kite and Eric B. Ford, The Astrophysical Journal, 31 Aug 2018. ...'water worlds' covered in deep oceans CAN support life by Mark Prigg, DailyMail.com, updated 02 Sep 2018. 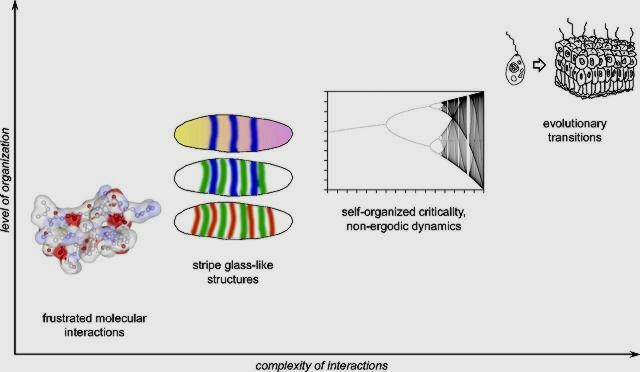 We argue that the physical foundation for understanding the origin and evolution of complexity can be gleaned at the interface between the theory of frustrated states resulting in pattern formation in glass-like media and the theory of self-organized criticality (SOC). Physical foundations of biological complexity by Yuri I. Wolf, Mikhail I. Katsnelson, and Eugene V. Koonin, doi:10.1073/pnas.1807890115, PNAS, online 27 Aug 2018. Distinguished biologists and theoreticians offer another conceptual approach to understanding sustainable evolutionary progress. We await a demonstration. "Prove it." The Evolution Prize, posted 2006, Bet on sustainable evolutionary progress?, 2002, and In Real or Artificial Life, Is Evolutionary Progress in a Closed System Possible?, 1999, are related postings. Computer Models of Evolution has background and history of this subject. We find the last universal common ancestor of cellular life to have predated the end of late heavy bombardment.... This comes from biologists at the University of Bristol, UK, who reinterpreted fossil data using new molecular clock analyses. In their phylogeny (adapted illustration below) the first node lands c. 4.5 billion years ago, deep in the Hadean, just after the Moon-forming impact, even before the late heavy bombardment (LHB). This would seem to be impossible, if life originated on Earth. But in our opinion, even this graph may be near-sighted. Integrated genomic and fossil evidence illuminates life's early evolution and eukaryote origin by Holly C. Betts et al., doi:10.1038/s41559-018-0644-x, Nature Ecology & Evolution, 20 Aug 2018. A timescale for the origin and evolution of all of life on Earth, University of Bristol (+PhysOrg.com), 20 Aug 2018. 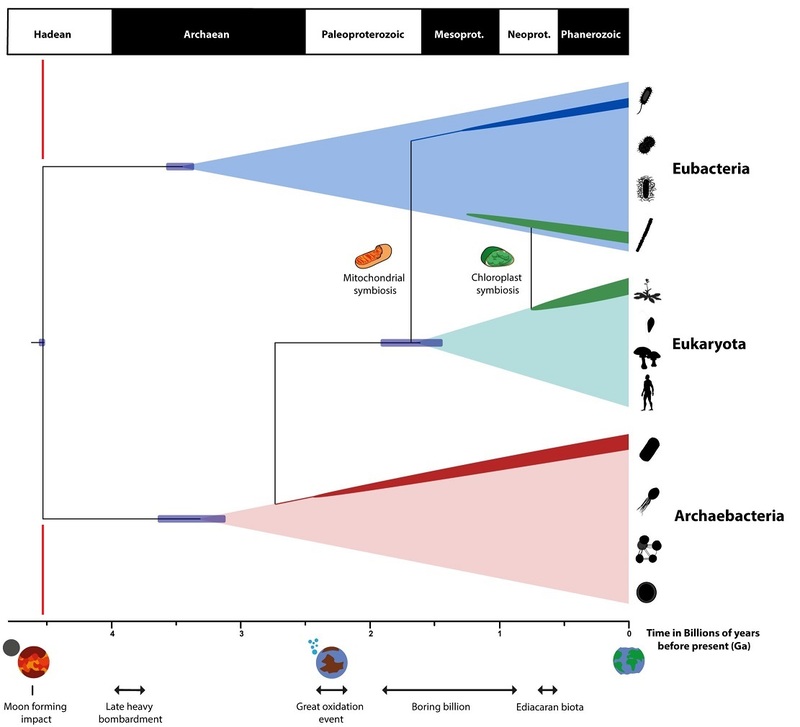 Ancestor of All Cellular Life on Earth Appeared Way Earlier Than We Thought by Sarah Sloat, Inverse (+Genome Web), 20 Aug 2018. Genes Older Than Earth? are related webpages. Thanks for alerts, Jerry Chancellor, Theodore Rigley and Stan Franklin. Thanks for comments, coauthor Davide Pisani. Thanks for supplying the original illustration, Holly Betts. Dynamical and Biological Panspermia Constraints Within Multi-planet Exosystems by Dimitri Veras et al., Astrobiology, online 10 Aug 2018. We derive a probability distribution function for life-bearing debris to reach a planetary orbit, and describe the survival of micro-organisms during planetary ejection, their journey through interplanetary space, and atmospheric entry. It is ...very likely that the numbers of membrane vesicles and gene transfer agents in environmental samples have been greatly underestimated, and that their roles in genetic transfer in nature could be much greater than previously appreciated. Small extracellular particles with big potential for horizontal gene transfer: membrane vesicles and gene transfer agents by M P Grüll, M E Mulligan and A S Lang, FEMS Microbiology Letters, 06 Aug 2018. Viruses and Other Gene Transfer Mechanisms has background and links related to HGT. Earth, Mars, And The Theory Of 'Swapping Spit' by Bill Retherford, Forbes, 30 Jul 2018. Life in the Universe is the subject of Richard Hoover's address at Kazan National Research Technical University, Russia, 11 AM, 01 Aug 2018. ...Microfossils in a Carbonaceous Meteorite is one of our entries about Hoover. 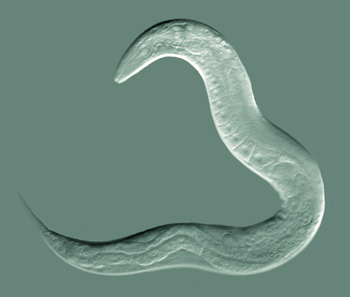 Nematodes can survive 400,000 g's of acceleration and up to 42,000 years of freezing. Caenorhabditis elegans Tolerates Hyperaccelerations up to 400,000 x g by Tiago Alves Jorge de Souza and Tiago Campos Pereira, Astrobiology, online 01 Jul 2018. Viable Nematodes from Late Pleistocene Permafrost of the Kolyma River Lowland by A. V. Shatilovich et al., Doklady Biological Sciences, May 2018. Thanks, Ted Steele and Stan Franklin. Science writer Elizabeth Pennisi makes these observations in an illustrated review (example, right) concerning the evolution of multicelularity. 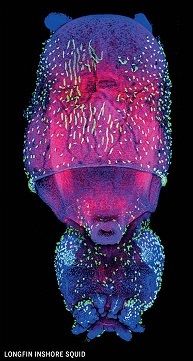 Several respected research teams conclude that multicellularity must have evolved easily, because many of the needed genes were already installed in single-celled species. ...much of the molecular equipment needed for cells to band together and coordinate their activities may have been in place well before multicellularity evolved. What functions the genes for multicellular features may have provided in one-celled species is uncertain, but, by darwinian logic, they must have done something. Else, the genes would not have been composed, nor preserved. Darwinists are adept at dealing with surprises, and indeed, former functions are suggested for several of these genes. Our perspective is altogether different, because genes that are available before deployment are a logical requirement in cosmic ancestry. Examples are accumulating. The power of many by Elizabeth Pennisi, Science, 29 Jun 2018. 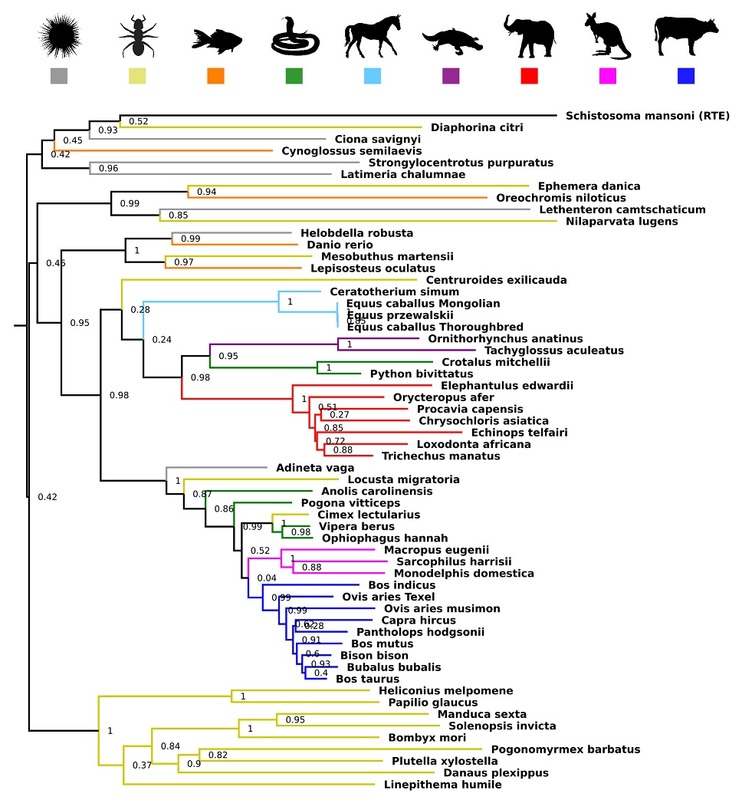 Metazoan Genes Older Than Metazoa? and Genes Older Than Earth? have additional evidence. Minerals may preserve free DNA for horizontal gene transfer (HGT) to facilitate evolution according to a pair of European specialists in geo, bio, and chemical sciences. Mineral-bound DNA may persist for millenia in soils and ocean sediments. HGT by transformation may install it into prokaryotes, resulting in macroevolutionary progress with important consequences for the environment, they observe. We are intrigued. And we wonder, could glaciers or even comets carry mineral-bound DNA? "On a global scale, free DNA (not part of a dead biomass) found in the uppermost 10 cm of recent marine sediments corresponds to about 0.30-0.45 Gt of DNA and might represent the largest reservoir of DNA in the oceans. Free DNA is found in the majority of Earth's surface ecosystems such as aqueous environments, soils and sediments. Up to 95% of this DNA is estimated to be in association with minerals and the prolonged longevity provided by this association significantly contributes to the available pool of evolutionary traits in the aqueous environments. When geologic processes and events start acting on this mineral archive of genes, we have a framework where minerals act as shuttles and facilitate transfer of evolutionary traits through time and across environments and can directly impact the evolution of life. HGT of DNA can occur though the transformation mechanism where the mineral adsorbed DNA are incorporated into the genome of a recipient organism and even fragmented and damaged DNA are able to transfer the genetic information. ...We advocate that the high amount of DNA associated with minerals can function as an archive for genes and evolutionary innovations which could be distributed across environments and timescales at a rate that depends on mineral assemblages, sedimentary processes and geochemical conditions." Mineral facilitated horizontal gene transfer: A new principle for evolution of life? by Karina K. Sand and Stanislav Jelavić, doi:10.1101/235531, BioRxiv, preprint online 21 Dec 2017. Genes Older Than Earth? describes an analysis also heavily referenced in the new article. Do thawing glaciers speed up evolution? is a possibly related entry, posted 26 Dec 2007. We interpret this feature as a stable body of liquid water on Mars. Radar evidence of subglacial liquid water on Mars by Roberto Orosei et al., Science, 25 Jul 2018. In this kind of environment that we know of on Earth, in the Antarctic, we have bacteria — coauthor Elena Pettinelli. A Watery Lake Is Detected on Mars, Raising the Potential for Alien Life by Kenneth Chang and Dennis Overbye, The New York Times, 25 Jul 2018. Underground Lake Found on Mars?... by Nadia Drake, National Geographic, 25 Jul 2018. Liquid Water on Mars! Really... by Emily Lakdawalla, Sky & Telescope, 25 Jul 2018. 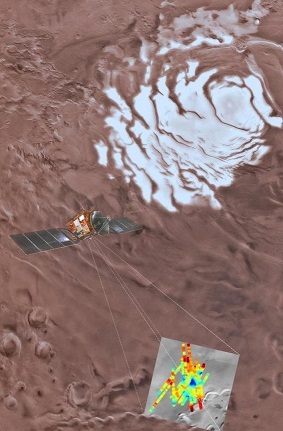 The rendering adapted from David Borga, Media INAF, shows ESA's Mars Express with radar pointing to the feature near Mars' icy south pole, via space.com, 24 Jul 2018. Thanks for early alerts, Rob Cooper, Jerry Chancellor, Bill Smith, John Minervini, Richard Hoover, Walter Klyce and Robert Sweeney. Life on Mars! has links about water there, but the lasting underground lake is new. In the 41 years since Viking, none of the many attempts to explain away the LR results nonbiologically has withstood scientific scrutiny, so no barrier remains to preclude the possibility of extant microbial life on Mars, or that the LR experiment detected it. Comments on the June 7, 2018, NASA News Release and Papers by Gilbert V. Levin and Patricia Ann Straat, Astrobiology, 16 Jul 2018. Data from the Curiosity rover..., about NASA's announcement, 07 Jun 2018. NASA May Have Discovered and Then Destroyed Organics on Mars in 1976 by Chelsea Gohd, Space.com, 11 Jul 2018. Thanks, Martin Langford. Life on Mars! has background and links about the Viking mission. Nearby Alien Planet May Be Capable of Supporting Life by Mike Wall, Space.com, 11 Jul 2018. Stellar and Planetary Characterization of the Ross 128 Exoplanetary System from APOGEE Spectra by Diogo Souto et al., The Astrophysical Journal Letters, 13 Jun 2018. Thanks, Stan Franklin. Life on Europa...? has related links. Widespread transfer of genes between species has radically changed the genomes of today's mammals, and been an important driver of evolution. This is the conclusion of bioinformaticians at the University of Adelaide who tracked two specific genes across 759 species of plants, animals and fungi. Professor David Adelson adds, Even though our recent work involved the analysis of genomes from over 750 species, we have only begun to scratch the surface of horizontal gene transfer. Horizontal transfer of BovB and L1 retrotransposons in eukaryotes by Atma M. Ivancevic et al., Genome Biology, 09 Jul 2018. Awareness of horizontal gene transfer (HGT) has been slow to arrive, but its importance in evolution is a longstanding prediction of cosmic ancestry. Viruses and Other Gene Transfer Mechanisms has background and many supporting links. Thanks, Google Alerts and Stan Franklin. The Growing Case for Life as a Cosmic Phenomenon is the subject of Chandra Wickramasinghe's forthcoming presentation at the 40th annual COSPAR (Committee on Space Research) Assembly in Pasadena, California. WHERE: Ballroom F, Pasadena Convention Center, 300 E Green St, Pasadena, CA 91101, USA. Hoyle and Wickramasinghe's Analysis of Interstellar Dust has background.